Morning at the Vandal. Schnitzel, soft scramble, breakfast salad, biscuit sandwich, biscuits and gravy. Melissa swings by. Mui wears a cool sweater. Light rain. Stopping by the apartment. Towel rack. Coffee and water. Taking a breather. Off to the Warhol. Rosa Villa. Mentally preparing. Matt fixes up the volumes. Parents take pictures. Shobun stops by first. Dennis and Becky. Liz Park. Six X Ate presentation. Dialogue with Jessica. Q & A. Dead banana leaves. Egg. Naming. All Chinese people look alike. MFA pushing wave. Seeing Moses, Brittany, and Lee. Commonplace Coffee. All filled. Walk to Crazy Mocha. Moses and Shobun and fam. Chatting away. People look tired. Everyone goes home to nap. Late dinner. Wrong side of the cemetery. Apteka. A bit chaotic. Ordering everything. Scotch drink. Service slightly slow. New waiter. Amazing as usual. Brittany and friends drop by. Moses and Nina. Ba is falling asleep. Off to Tucker's. More drinks and a lot of pizza. Hodgepodge of families. Mingling. Red polo photoshoot. Some people want to walk early tomorrow. 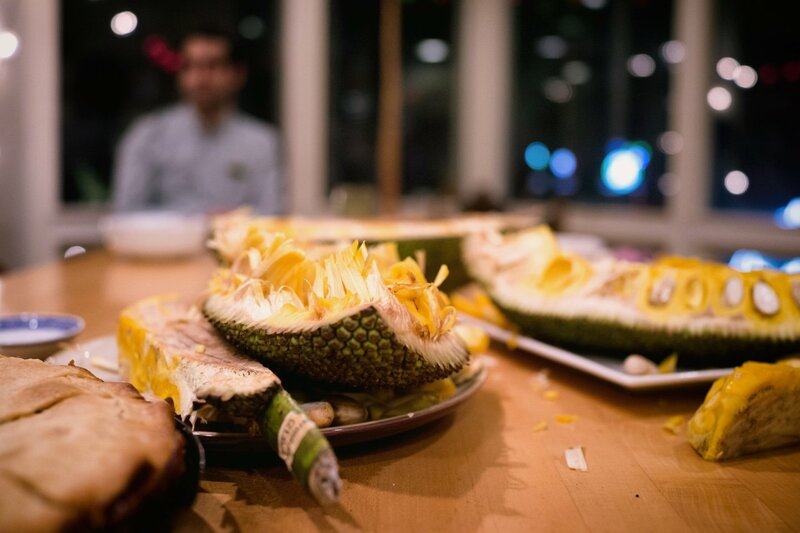 Jesse breaks out the durian. Doesn't smell that bad. Good night family. One last drink at the Yard. Jesse and I split a drink. Tucker gets seltzer. Dan does his thing. Falling asleep. People watching. Dan and Jesse Uber. Tucker gives me boxes of pizza and some candy. Uber home.